You’ve likely heard of dental implants as the most superior solution to replacing missing teeth. But what exactly makes dental implants better than other restorative options? Dental implants are not designed like partials, bridges or dentures that are secured to other teeth or stuck in place with adhesive creams. Dental implants are anchored in a unique way, and they are the most precise replica of your natural teeth. Unlike any other restorative option, dental implants replace the missing tooth as well as the missing tooth root. This is a key difference, and one that delivers several advantages towards your smile confidence and quality of life. Dental implants involve the surgical placement of a small titanium post into your jawbone. Titanium is safe, durable and biocompatible! Over time, the implant fuses to the surrounding bone during a natural process called osseointegration. This forms the firm foundation for the implant restoration to be placed on top. 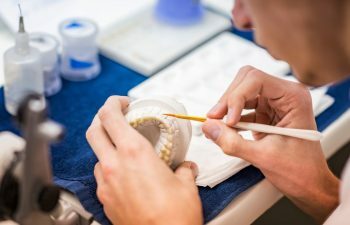 Depending on your unique needs and preferences, your restoration may be a crown, bridge or denture. In any case, it will carry the unrivaled stability of being anchored to your jawbone just like a real tooth. Compared to other options, dental implants do cost more. However, considering the lifetime benefits of using dental implants, the return on your investment is priceless. Dental implants can help you regain a confident and beautiful smile at any age. Call Bear Brook Dental Care to learn more about why dental implants may be right for you.